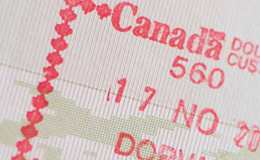 NOTE: On January 1, 2015, the Canadian government launched its new "Express Entry" system for skilled foreign workers who are applying for a Permanent Resident (PR) Visa to Canada through the Federal Skilled Workers Program (FSWP), Federal Skilled Trades Program (FSTP), and Canadian Experience Class (CEC) Program. The Provincial Nominees Program (PNP) will also be affected by the "Express Entry" system. A key goal of the "Express Entry" program is to speed up the process of approving qualified skilled foreign workers for a PR Visa to Canada so they can help meet the needs of Canadian businesses. To learn more about the new "Express Entry" Canadian immigration system, click here! Want to become a Canadian citizen? The first step is to be issued a visa by the Canadian government. Below you will find information about the various Canadian visa types, but first you may want to learn more about the many benefits of Canadian citizenship. Federal Skilled Trades Program (FSTP) This Canadian visa program started on January 2, 2013, and offers a Permanent Resident Visa to Canada for qualified tradespeople in such occupations as aircraft mechanics, carpenters, crane operators, electricians, heavy-duty equipment mechanics, ironworkers, machinists, plumbers, welders and other skilled trades. Read more about the Federal Skilled Trades Program. Federal Skilled Workers Program (FSWP) This Canadian visa is a permanent residency visa. Applicants are evaluated based on their education (which, for many eligible occupations, includes a university degree), work experience, knowledge of French and/or English and age. All you need is 67 points to qualify for this visa! Your profession must also be a wanted profession in Canada (recent examples include accountants, various types of engineers and managers, financial analysts, occupational therapists, nurses, physicians, computer programmers and university professors). The rules for applying for this visa are often changing, however, our immigration consultants keep up-to-date daily with any changes that may occur. Read more about Work Visa Canada. Provincial Nomination Programs (PNP) For those who will not qualify for a skilled worker visa, there is still the chance to receive Canadian permanent residency. The Provincial visas are aimed at semi or low skilled professionals that will still be able to come to Canada and work and contribute to the Canadian economy. With this visa, you will be nominated for a specific province of Canada that is looking for employees in certain professions. The needed professions are frequently changing in each province; however, our immigration consultants stay constantly "in-the-know" about possible changes. Read more about Provincial Nomination Programs. Quebec-Selected Skilled Workers Program (QSWP) The Canadian province of Quebec has a special program for immigration to Canada called the Quebec-Selected Skilled Workers Program (QSWP). Quebec is the largest province in Canada and it needs thousands of skilled foreign workers for various trades and professions – especially if they have adequate French language skills (since French is the dominant language used in Quebec). If you receive enough points on this points-based Canadian immigration program and are selected by Quebec’s provincial government, you may then apply to the Canadian national government for a Permanent Resident Visa to Canada! Read more about this unique Quebec immigration program. Family-Sponsorship Program Canada understands how important family is, and for this reason offers the chance to reunite family in other countries to come join you in your new life in Canada. Once you have become a Canadian Citizen or a permanent resident, you are entitled to sponsor your spouse/common-law partner and dependent children and also give them the chance to become permanent residents. You are then responsible for supporting your family financially, and they will enjoy the benefits of residency - being able to live, study and work in Canada. Read more about Family-Sponsorship Visa. Live-in Caregiver Program (LCP) This is a special visa for live-in caregivers who have qualified to provide care for children, elderly or the disabled in private homes without supervision. The visa entitles the caregiver to live in a private home in Canada. This visa process is particularly complicated, requiring work experience, a high school diploma and a good English or French level. Contracts must be written and signed by the future employer and yourself. Read more about Live-in Caregiver Program.